Guess what is on newsstands right now? The fourth issue of Quiltmaker's 100 blocks! I'll be giving away a free issue of this fun magazine later on in this post and so will a lot of other designers. Not to mention there are other GREAT prizes. Hop on over to Quiltmaker to find out more. Three of these in a row would make a great springtime table runner. But wait... we haven't even gotten to Christmas - why am I talking about spring? Speaking of the holidays, I have done ABSOLUTELY NOTHING to prepare for them. I haven't made a gift, bought a present, or even thought about decorations. I HAVE driven an inordinate amount of carpools shuttling kids to Nutcracker rehearsals, so that should count for something. Is anyone else in such a quandry? But I know there are more organized souls out there who start sewing gifts in July and I would love to hear yours ideas. 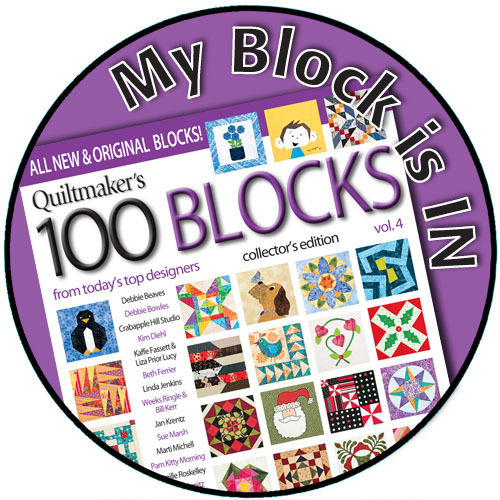 So, to enter the giveaway for Volume 4 of Quiltermaker's 100 Blocks, leave a comment describing something you have been working on for someone else (or for yourself !). And if you are hopelessly behind, like me, tell me what you would like to make. You must be a follower to enter and please leave me a way to contact you should you win. The deadline to enter is this Sunday, the 13th, at midnight. This giveaway is now closed... Thanks for your interest! I am constantly trying to catch up with things...I feel like I have my Christmas sewing under control (not that I've started yet, but in my mind at least, the timeline is doable), lol. Very pretty block...love the colors!! I just finished a runner and some rag bags. Then I'll be working on some table toppers and mug rugs. Love the applique flowers - that is my next thing to try. I'm making a pirate quilt using Emily Taylor fabric for my other half....who thinks he is a pirate! I've sewn 3 car caddies, a zippered pouch and an art rollup. None of them are technically quilting projects but they are for Christmas. 3 will go in my Operation Christmas Child shoeboxes and 2 will be for our grandsons. And my list is very long - I hope I can get most of it done! Thanks for showing your lovely block and for sharing the magazine. I'm working on a lap quilt for my daughter for Christmas - hope I can finish it in time!! 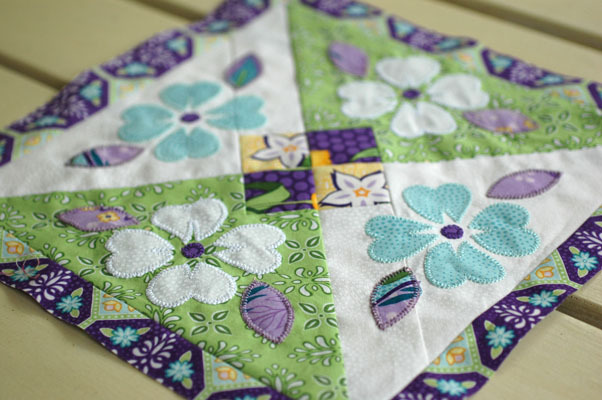 Your block is amazing and you are right it would make a great spring time table runner. I much prefer to think about spring (denial is a great place to be). I have a ton of projects started for Christmas - actually a couple of table runners. Now to only get them finished. Your block is beautiful!! I am so far behind :) I've been working on a block of the month I would like to give to my mother and just can't seem to focus on it!! What you've designed with your fabric design and colors is beautiful. Looks like a Dogwood tree. This year nothing got done, and I'm not stressing - refuse to. I would have liked to have been working on mini quilts for people. I am way behind on a bunch of bindings...Jammer's fire truck quilt, his 100 Good Wishes quilt, and Sunshine's Luv U cuddle quilt. With 2 little ones around there is never enough time. I would really love to make something for everyone in my family this year and hope that I can at least churn out mug rugs for all. Next year I'm planning on placemat sets. So I am so far behind....nothing bought, nothing done and 2 trips in-between! My plan is to spend Sunday this week armed with Visa and Amazon. When the bulk is on it's way I hope to make 4 little girls holiday aprons to bake with Nana. It's time for me to get my act together and start making some gifts. Seems we are on the fast track to Christmas. I've got gifts made for my long distance BFF but can't reveal it here. I made a lot of tabletoppers for birthday gifts this year so need to come up with something different now for Christmas. Your block is lovely - thanks for a chance in your giveaway. 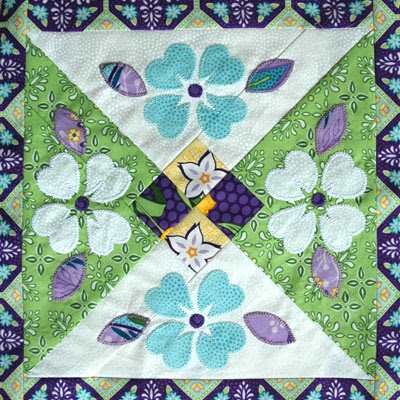 Gorgeous block you designed...I love for a block to be a little different, like having a mix of applique (or even embroidery) with the piecing. I so need to get going on Christmas gifts - and I promised some bazaar (not bizarre) items to the historical society, too. EEK! Very nice block! I haven't sewn a thing for Christmas yet..yea...I know, I'm hopelessly behind. Oh well, I'll get some seat time at my machine this weekend and get started on some dish towel hems and some fabric napkins. Since 2007 I've been making, all-hand pieced and quilted, a grandmother's flower garden quilt for my god-daughter's first child. She is only 10 now so I still have some time to finish....I hope. Great block! I always try to make things for my mom--so far I have a pair of socks knit. I also always make ornaments for everyone--this year I'm knitting miniature stockings. I'd really like to have my son's quilt done for him for Christmas--don't know if that will happen. Thanks for the chance to win! Love your block great for the two granddaughters. I have been a sewing fool... I have made makeup bags, purses, bears dolls.. etc... I will just keep going until Christmas... love giving my projects away. Don't sweat the schedule - I gave up that mid-summer sewing a long time ago and have managed to survive all these years! The holidays are supposed to be fun. Your block is beautiful! Currently I am working on a baby quilt for my next grandbaby...ties all in blues, blue stripes, blue plaids, etc. He doesn't arrive by February, so maybe I can get this done??? :-) Love reading your blog as well as those of the others...what a great way to start my day! I'm so not thinking Christmas yet, as I am making my daughter's wedding gown (Jan 7 date) - and I know what you mean about Nutcracker rehearsals, as she is a dancer...and I used to be there working on costumes as well...not just carpooling. I love your block - reminds me not only of hearts but the dogwood trees in our yard, so I think my spring runner would have to be white and pink flowers! Every flippin year I want to make a new Christmas tree skirt...again not happening. We have the same tree skirt I made when we first married over 26 years ago. Thanks for the chance to win and congrats on your block in the magazine!!! Just love your block, it's adorable! I think I'd rather think about spring too - just no way I'm gonna catch up for Christmas. I made a Pineapple Blossom for friends and thought I had a great jump on it because I finished the top in May. However, it won't get back from the quilter until after Thanksgiving. Eeessh! I am going to make placemat sets and table runners for Christmas gifts this year. That is, once I finish the ornaments that I am making for a swap, and the little gift that I am making to go with the ornament... maybe I should stop blog-hopping and get to sewing! i have several quilts in various stages to give and a list of little projects make. 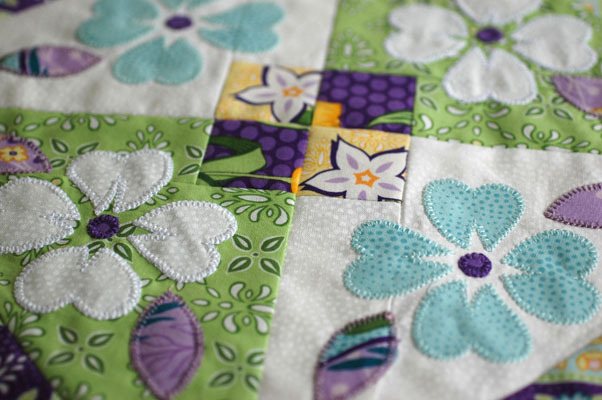 one of my little projects could use your little appliques ... such a pretty block! Very cute block! I always have grand ideas for Christmas sewing, but when reality sets in, I find myself out shopping! :-o LOL I am working on a few scarves. Thanks for the fun! I'm in the middle of a couple of projects....one Christmas runner for a great friend of mine and a Quilt that our year 7s are making as an art project to leave at the school as a memorial of them! They've each been stitching a block with their name on it and I'm doing the 'in-between' blocks and putting it all together. I must hurry with both as the school year's nearly over and Christmas is coming fast! Ok, you asked for it... I started a project in July. It's a machine embroidered book "Twas the Night Before Christmas"! Each page takes between 4 and 6.5 hours to embroider and there will be 26 pages!! My plan is to make 3 books to give to each of my children's families. Now, here's the catch...I'm making them for Christmas 2012!!!! I am still working on a doll quilt for my granddaughter, whose birthday was mid-August! I am learning to quilt...or should I say, I am becoming an expert in mistakes and removing stitches. I am making a quilt for each of my nieces and nephews. Two to go... they are aged 4 and 6 already, ahem, better get cracking! I am making a picnic quilt for my sister. Congrats on your block - I really love it. I am three big quilts behind - life just keep getting in the way of quilting.. Right now I don't have any active quilting projects...I've been cross stitching christmas ornaments for gifts, and knitting some gifts also. I am forever behind..... I would love to get stockings made for each of the grandchildren this year. My two daughters gave me 2 granddaughters two days apart, starting 2 days after my birthday on October 21st! What an exciting week that was! So now I have two more stockings I need to make. I love your block - gorgeous! I have been working on stuff on and off for a while now (completed a crochet scarf/hat for my sister, a messenger bag for niece, tote & pillow for nephew and some small pillow ornaments) but I have MORE projects to make including a winter rag quilt for our home, table runner & napkins for us & sister & bil, clutch purses for other nieces, etc. I should get off the computer to do them! ha thanks for the chance to win Amanda!